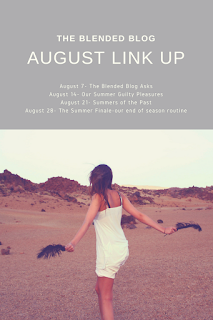 I've been feeling like there was something wrong with me because I'm not all caught up in the "back to school" fever that seems to have the rest of the nation in a death grip right now. 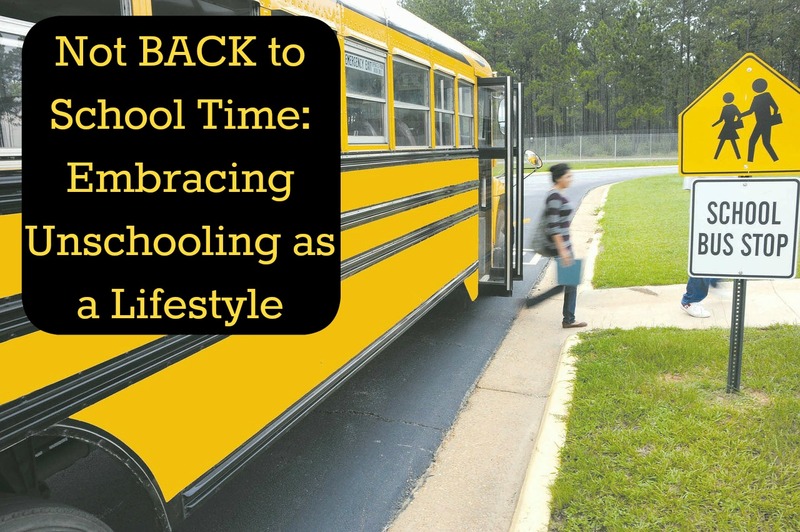 Even fellow homeschoolers all start heading "back to school" and talk turns to curriculum, when they're going to start their first day back, etc. and while I feel a bit left out I guess I also feel a bit bewildered, and, dare I admit it? Apathetic. I'm sick of planning, I'm sick of keeping track of school days and non- school days, I'm sick of worrying about what my kids are learning or doing every minute of every day. I'm sick of feeling like I need to justify what they are learning and when they are learning it, because I do feel like they truly are learning every day all day long. It's not that I'm burnt out. It's not that homeschooling is hard or not working for us. It's not that I've stopped caring about my kids and what they are learning and doing, it's just that I'm just sick of caring what OTHER people think my kids are learning and doing all day. I'm sick of my own need to compare and contrast my kids to all those other kids we see and interact with. I think as a society our schools and methods of learning are so ingrained they're hard to shake off, especially as a parent. Unschoolers, in particular, are so far from that spectrum of learning that it's scary. It's daunting to know that there is no concrete plan set in place for the school year, no checklist of facts and subjects to tick off one by one with a great sense of accomplishment, no way to point to something and say "there, that is what they were learning, here is the workbook we completed to show you." How I grew up learning and how I want my kids to learn is so entirely different it's sometimes hard to me to remember! However, that doesn't mean I don't like this time of year. My kids and I smile as we walk by isle upon isle of backpacks, notebook and school supplies knowing we don't have to buy any! We smile when all their friends talk about summer fun ending as we know Sept and Oct. will be jam packed with park days, museum trips, trips to the beach, and days lazy days spent swimming and having fun. We grin when fellow homeschoolers talk about their first day back at lessons and ask when we'll start. While, we love hitting the museums and zoos most of all now that we'll pretty much have them back to ourselves we don't have any pressing need to get any particular thing done or started. I don't feel like learning ever stops or is separate from life so while I often feel like I have to plan lessons (because everyone else does) and I feel like we really need to start school in September (because everyone else does) I'm just not feeling it this year. I don't want to do it! I'm not feeling the push to start school, I'm definitely not feeling a need to start planning lessons, and I'm kind of hopeful that I won't ever feel that need again, or at least if I do it's in small doses! I can tell which things the boys have been most interested in over the past year because they're the things they still remember, talk about and ask to do again. Those lessons I pushed on them that they weren't really interested in are the ones they don't even REMEMBER! If ever a lesson in the validity of unschooling was needed, that was it. My boys retained only those things that they were interested in, engaged in, and (often) planned on their own. I want learning to be fun and I encourage my boys to play games, build, create, and find their own projects. Alec decided to try the hardest level wile Grammar Ninja and was laughing so hard at all the ones he was getting wrong. I had to hold myself back from telling him to try an easier level because he was having so much fun and I know he was learning! We had gone over noun, verb and adjective but he also learned adverb, preposition, article and the like. I also know the fun he was having was the most important part because now he can't wait to play again! ﻿We also played a few rounds of Life. Ian and I played the first round while Alec played Grammar Ninja and Evan played Word Monkey then we played another round of Life altogether. I love the game of Life. The boys get to make decisions about going to college, which house they can really afford or if it's worth it to take out a loan to buy their dream home. They have to count, add and subtract to pay bills and make change. They compare salaries of jobs and debate the pros and cons of having a job they'd actually enjoy or one that just makes a lot of money. They debate the pros and cons of having kids and whether they'd prefer girls or boys. They laugh, joke, shout and yell and have a great time. They read, count, and even negotiate. I was most impressed when Ian was able to add up all his money at the end of the game, unfortunately he did not have enough to win. Evan won (again!). After dinner we headed to a local park to meet up with some friends and all the kids played with scooters, hula hoops and the playground equipment. Alec taught another little boy (whom he managed to make friends with by the end of the night) to hula hoop and had a great time trying out new moves, like spinning a circle while hula hooping! He finally made it across both sets of jungle gym bars and hoops; something he's been trying to do every time we visit the park. The boys played in the sprinklers, took a walk to see the ducks and frogs and practiced making the scooters jump (a skill they learned by watching their friends). We had some minor injuries and tears but mostly we had laughter and fun. They got to swing super high on the swings, climb rock walls, chain walls, and up the slides. They slid down slides, ran round ramps and up ladders. Alec later made another new friend, an older 11 year old girl, who showed him how to climb up onto the top of the jungle gym bars and maneuver himself around. They had the best time and we capped the night off with a nice cool treat-- some yummy ice cream! Alec sitting ON the monkey bars-- such a monkey! On the way home I couldn't help think what a perfect summer day we had, making memories. There's something timeless about these kinds of days and memories and I'm so glad to be sharing them with the boys. Even better was the fact that the boys couldn't wait to get back to the car and read their books on the way home. Alec kept reading funny parts of his book out loud to share with Evan and they were all having such a great time. I even allowed them all to read and look at books for as long as they'd like once in bed for the night. I have no idea what time they fell asleep but I do know I had turn off a few lights when I went to bed and pry open books away from sleeping little boys. I just love that! No no it's NOT back to school time for us; we're just going to enjoy the rest of our summer and see what tomorrow brings. Our summer is not ending; in fact, with all the kids heading back to school it's just beginning! A Busy Weekend of Learning! A Late Night Out On a School Night? Bowling, Blueberries and Blind Taste Test. What can you learn at an amusement park?